Leafy sea dragons, Phycodurus eques (Günther, 1865), aka leafy seadragons or Glauert’s seadragon, Phycodorus eques (Günther, 1865), and Phyllopteryx eques (Günther, 1865), get their common names from the leaf-like appendages on their bodies. 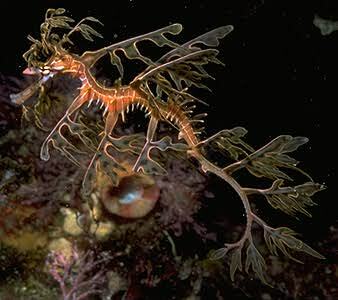 Leafy sea dragons have more of the leaf-like appendages on their bodies than the closely-related weedy sea dragons. Both species resemble floating pieces of seaweed which makes them difficult for predators to find in their natural habitat. They reach a total length of 35 cm. These superbly camouflaged fishes, in the same Family Syngnathidae as seahorses and pipefishes, are only found in Australia’s temperate waters. This species has only been recorded from the southern coastline of Australia, from Kangaroo Island, South Australia to Rottnest Island, Western Australia. 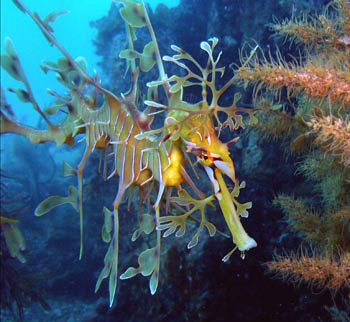 These fishes live over sand patches among kelp-covered rocks below the low tide line in depths from about 3-50 m.
The leafy sea dragon, Phycodurus eques, has a long pipe-like snout with a small terminal mouth. They feed on plankton, mysids and other small crustaceans. They have one of the most spectacular examples of camouflage: neither prey nor predators recognize them as a fish. 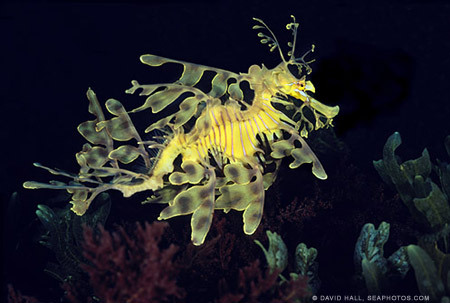 Unlike seahorses, sea dragons do not have a pouch for rearing their young. Instead, the male carries the eggs fixed to the underside of his tail from where they eventually hatch. 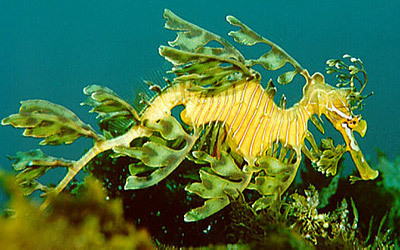 When male sea dragons are ready to receive eggs from the female, the lower half of the tail on the male appears wrinkled. During mating, females lay 100-250 eggs onto a special ‘brood patch’ on the underside of the male’s tails, where they are attached and fertilized. This brood patch, consisting of cups of blood-rich tissue each holding one egg, and is specifically developed by the male for use during the breeding season (August-March). The bright pink eggs become embedded in the cups of the brood patch, receiving oxygen via the cups’ blood vessels. During each breeding season, male leafy sea dragons will hatch two batches of eggs. 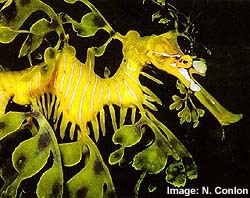 After a period of about 6-8 weeks from conception, the male ‘gives birth’ to miniature juvenile versions of sea dragons. As soon as a baby sea dragon leaves the safety of their father’s tail, they are on their own. For 2-3 days after birth, baby sea dragons are sustained by their yolk sacs. After this, they hunt small zooplankton, such as copepods and rotifers, until large enough to hunt juvenile mysids. Sea dragons grow to a length of 20 cm after one year, reaching their mature length at two years. In the wild, young sea dragons are preyed upon by other fish, crustaceans and even sea anemones. Young sea dragons look more delicate, and are often differently colored than adults, and may hide in different types of seaweeds. 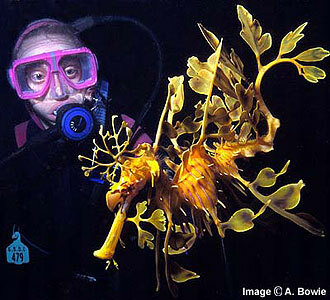 The leafy sea dragon is a rare sight and a very fragile creature. Handling of any sort is discouraged due to the likelihood of injuring this animal. They do seem to enjoy having their picture taken though.